A Little bit of Lorene: Another Table Runner Swap is finished! Hi Everyone! 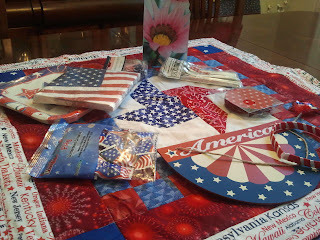 We had another table runner swap over at The Quilted Table . They have been so fun to participate in. I have liked what I made and what I have been given. This time I sent to a CA. girl and received from another CA girl! This is what I sent Dianna. You might be wondering what a target has to do with anything. Well, Dianna has grands. I found a fun tut for a marshmallow/pom pom catapult for kids to make out of tongue depressors, rubber bands. My grands LOVE them. so I sent them along to share with her grands. It was fun getting everything together. I feel like it was Christmas. Everything was wrapped in really cute red/tan check paper. There are no before pictures. who has time for that!!! 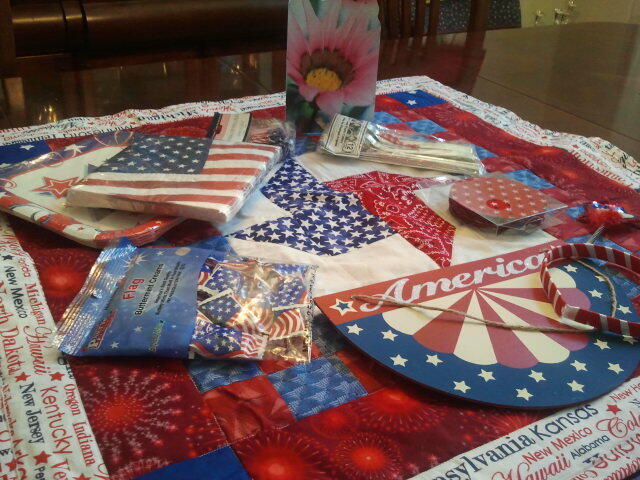 Cathy sent lots of stuff for our celebration for the 4th. 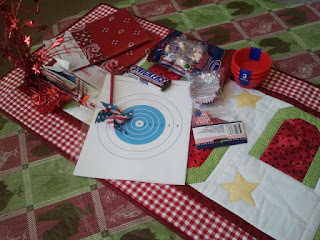 napkins, coasters, plates, silverware, candies a cute wall hanging adorable headband that my granddaughters will be so jealous of and of course the really nice table runner. Thank you Cathy, you are a sweetie for sure. I appreciate all you did. And so does my family!! because this means a party is in the works.